Or possibly it was thrown from a speeding Mustang, ridden by feral farm animals, into the jaws of an outlaw coyote…Maybe I’ve been reading too much Adventures of Hank the Cowdog to the children. I’m not sure. All I know is our rhythm has gone missing and I’m struggling to find it. 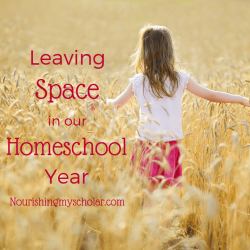 Homeschooling through a move is hard! Do you ever feel like one of those trapeze artists at the circus about to jump through a flaming ring while juggling swords and balancing a poodle on your head? All the while praying your leotard doesn’t split mid-jump? You see on top of motherhood and homeschooling we also bought a house. Super exciting I know! But this house needs some TLC and since we are doing most of the work ourselves…and learning as we go…it has been an enormous project. 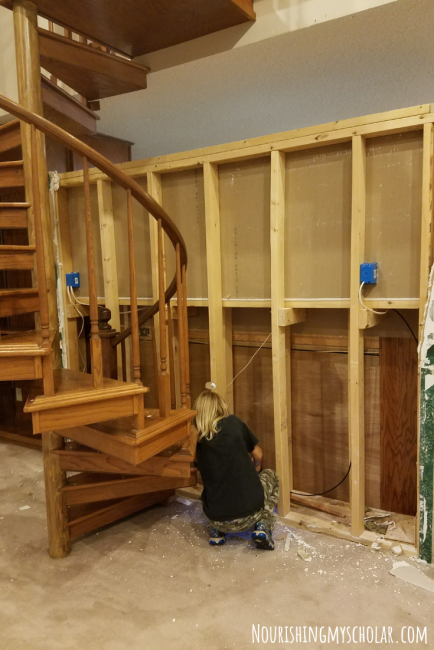 Amid guitar lessons, ballet practice, play rehearsals, barn chores, and everything else we are now spending most evenings over at the new house working on tearing down walls, sanding, painting, building new chicken coops and animal stalls. Why yes, thermal dynamics can be taught with sandpaper and power tools. What’s for dinner you ask? How does a hot pocket and string cheese sound? I’m kidding! I also offered them an apple with peanut butter! Here’s the big pink elephant in the room. It happens to us all. I could say that starting tomorrow we will have “this and that” schedule and everything will be smooth as silk again. But we all know better. For us, until we get moved into the new house and then after several months of habitation…our rhythm will be off. That’s how life changes work, big or small. They take time; time to adjust and settle and to find what works. Rhythms change. 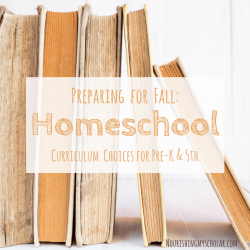 Homeschool and motherhood have seasons. Just like in nature there are seasons of busy-ness and seasons of rest. Our rhythm feels lost right now because it’s changing. We are trying to create something extraordinary and beautiful. Our homeschool is part of that beauty. So we are focused on what is working and making sure we are doing those things every day. Guess what? Each family is different and unique. 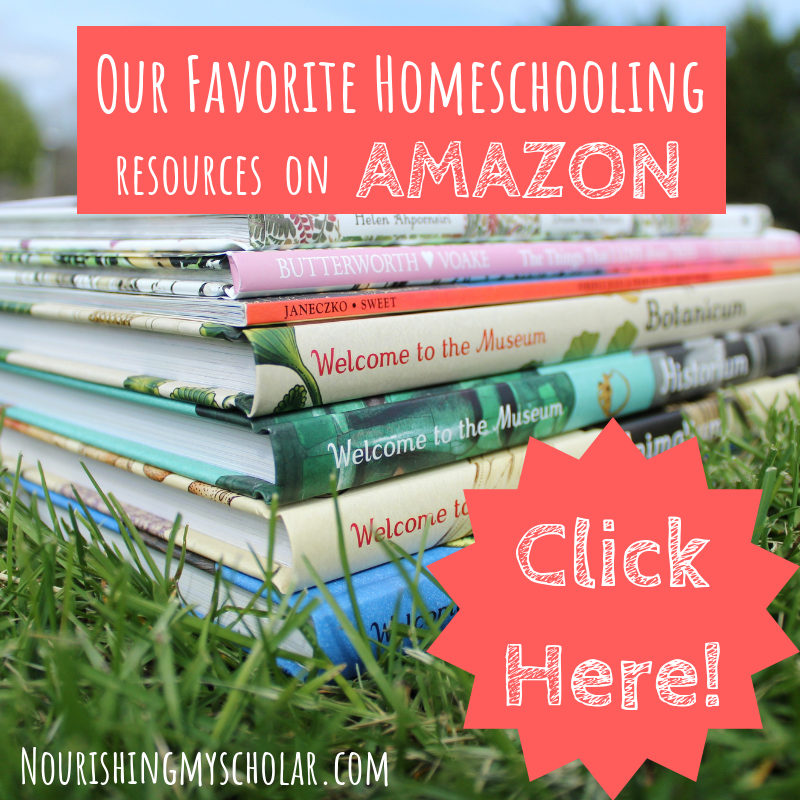 Homeschooling is about finding what works for you and your kids. I’m finding what’s working for my family during this stressful time. Also remember, that learning happens everywhere not just with a textbook. Looking back on the past couple of weeks I realize just how much we got accomplished. Note: It’s totally fine to accidentally do some homeschooling awesomeness and then add it to your “What we accomplished” list. like…learned power tool safety. CHECK! Don’t try to do it all, folks! Focus on what works and make those your priorities. Read alouds help build connections with our kiddos. We enjoyed the Adventures of Hank the Cowdog during our move. Audiobooks come to the rescue when you can’t fit read alouds into your day! These are great for car schooling, or during appointments. 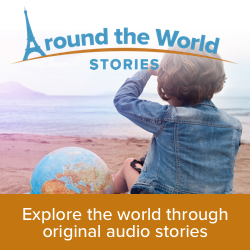 Around the World Stories are another form of audio that combines geography with stories. Documentaries are loaded with educational benefits! 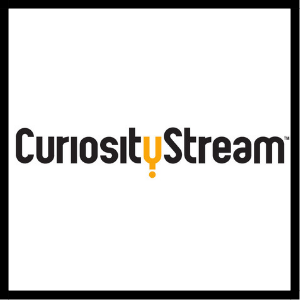 Curiosity Stream is our favorite go-to for documentaries. Games are an easy way to sneak in stealth learning for all sorts of subjects. Subscription boxes can take some of the pressure off when your rhythm gets off. We adore Kiwi Crate for my 6-year-old and Tinker Crate for my 11-year-old. Outsource some of the homeschool work! We are big fans of Reading Eggs for younger kids; Smartick is a wonderful math program for ages 12 and younger; Duolingo is a FREE foreign language program that my son and I enjoy; Outschool offers affordable online classes for all ages. My son has taken classes on Wilderness Survival, Harry Potter Potions, and Dragons from East to West! Simplifying our days as much as possible helps tremendously. Some days our plans still go awry. Some days the kids may only make it to their ballet lessons and that’s it! It’s OK. You may or may not keep that circus poodle on your head…while jumping through flaming hoops. Oh, what must the neighbors think?! It’s your turn. 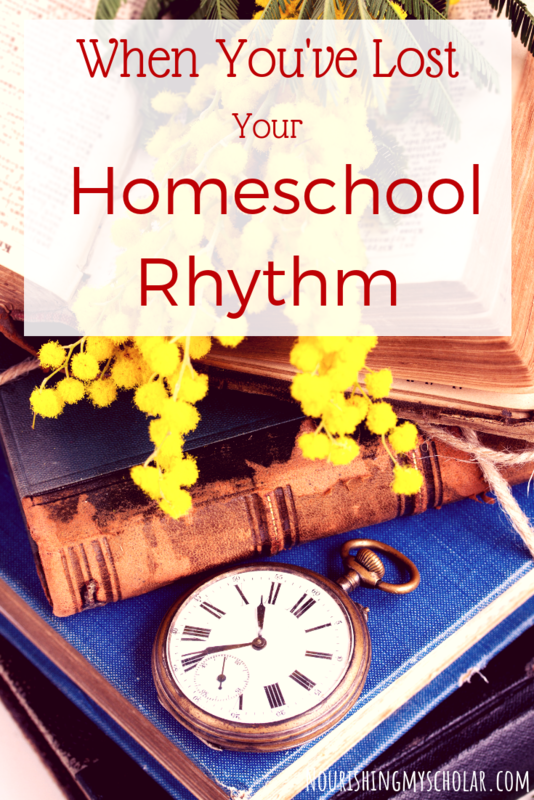 Tell me what you do when you’ve lost your homeschool rhythm? 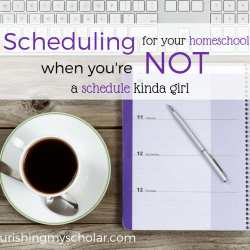 Scheduling for your homeschool can be intimidating. Especially, when you're not a schedule kinda girl. 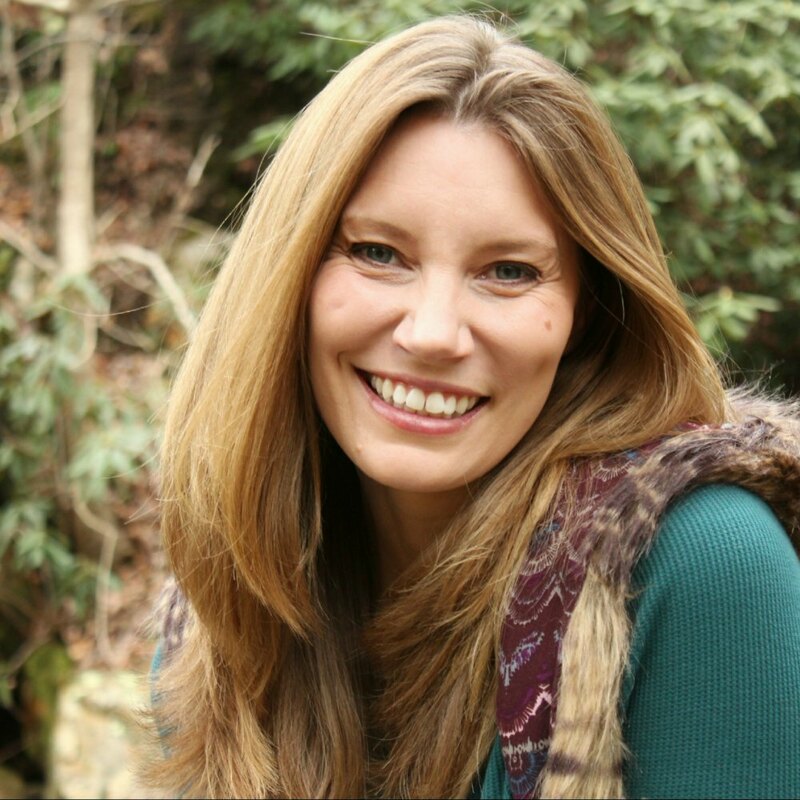 Erin is a writer, blogger, and homeschooler to two intense kids. She loves nature, farm life, good books, knitting, new pens, and hot coffee. Erin is a contributing writer for Weird Unsocialized Homeschoolers. 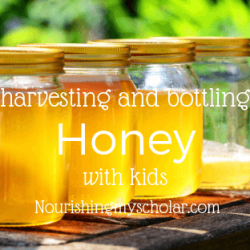 Her work has also been featured on Simple Homeschool and Book Shark. Typically when we’ve lost our rhythm we focus on reading, try to get some sort of math in there and just keeping doing something/ anything until we fall into a new one. I have that in between time but it is life. Whether our rhythm is disrupted by life or the fact that kids have outgrown our old one and need a new one — it does happen. I’m learning that during those times I need to let go and just try to work with what is working and tweak those things that aren’t. I KNOW you have been adding in plenty of art too and that your kids are still devour books galore and you are all going to come out on the other side just fine. Thank you! I know we will make it through this weird transition. It’s just difficult in the moment. Congratulations on the new house! Such an exciting (and exhausting) time! It is exhausting! I’m trying my best to remain present and in the moment with the children…but it’s hard when there are a million and one things on your brain that you know you need to get done. Books and games help as does getting out into nature. Thanks so much for stopping by and sharing your experience! In the past when we’ve lost our home school rhythm I have just declared a break! We played games and watched shows and picked up LARGE bags of books at the library until something sparked us. This year is the first year I’m trying to have an actual schedule (with terms and curriculum and going to a co-op one day a week) which is new and kind of fun and I am so glad I kept our curriculum subjects to just 3: Bible, Story of the World and Life of Fred. Every other subject we just explore as it comes and we have lots of time left free to do so. And, we’ve discovered we don’t like Life of Fred as much as we thought we would, so when we finish this book my oldest and I will explore something different for math :). Oh yes, we check out LARGE bags of books too! So much so that when they were a day late…I had to cough up $21…. Library fines drive my hubby crazy, but I seem them as a fact of life, ha! Books and games have been our saving grace and from the books come the inspiration and exploration of other subjects. I love that! Good luck with your math adventure. I’ve heard great things about Teaching Textbooks, and Shiller Math. We use Beast Academy and Khan Academy. Thanks for stopping by and sharing your experiences! I love this part, “Our rhythm feels lost right now because it’s changing. We are trying to create something extraordinary and beautiful. Our homeschool is part of that beauty. So we are focused on what is working and making sure we are doing those things every day.” For my family, that is part of the rhythm. Paying attention of how we are needing to live in the moment. I am feeling overwhelemd too. We took on too much this semester. We always do in fall. I try to remind myself they are always learning and practicing, even if we don’t get to the thing I hoped we would. And your staircase is amazing! Yes! Those overwhelming thoughts and feeling like I’m not doing enough…when in reality I’m doing too much…and the kids are feeling moms manic mode…yeah…it’s rough! It’s such a balancing act trying to do All. The. Things. while not doing everything, ya know? I’m working on it and if I manage to succeed I’ll let you know. But more likely there will be another post soon about paying attention to Everyone. and Everything Else…except myself. Thanks for stopping by and sharing your experiences! And thanks, I’m loving our staircase too! I love this SO much! I dream of one day being able to home school (you are my hero). Even though I work for the public school system the thought of my child entering into it next fall absolutely terrifies me!